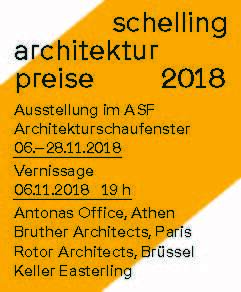 The Schelling Architecture Foundation grants the Schelling Architecture Award for Architecture and Architectural Theory once every two years. The awards recognise future-oriented developments in architecture as well as incisive accomplishments in architectural theory. The winner of this year's Architecture Award is ROTOR. After the short presentations, the jury decided on the Belgian architecture office. For the first time, the audience had the opportunity to vote and voted majority for rotor.